Definition: an increase in the amount of goods and services produced per head of the population over a period of time. In our extremely photographed world, real images that document the daily talked subject of economic growth are unexpectedly rare. Instead, one is left with a preview of economic growth in its most abstract form: a measurement and theoretical concept. 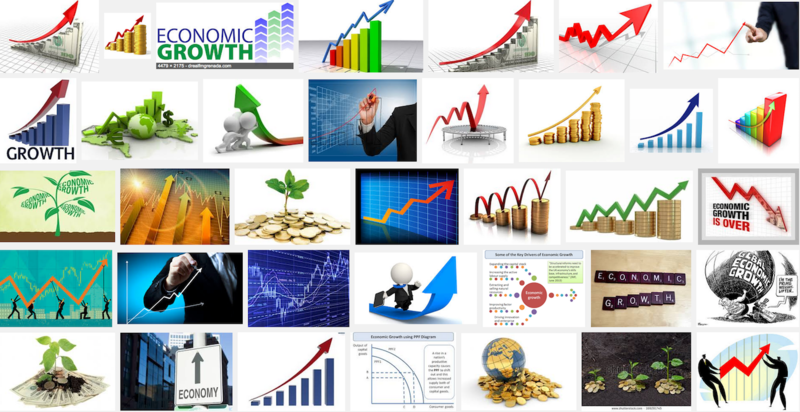 Images are mainly confined to arrows, bar charts, piles of money and growing trees. A few stylised human beings will appear from time to time to underline their importance as major actors. In those images, they will literally support the heavy weight economic growth or draw its final upward North East direction. All in all, the red or hopeful green arrow is the most frequent archetype and symbol for growth. The arrow is one of the few universal symbols used since the emergence of humans, representing the hunter’s bow and arrow. It then much later on developed into abstraction to indicate direction in maps, movement or logical implication in mathematics. As such, the economic growth arrow contains all the symbolic meanings: strength, energy, focus, accuracy, path and destiny. Economic growth is always pointing towards an unavoidable fate of exponential progress. However this journey can either be fast and straightforward (think free hand curve Nike logo swoosh) or accidental and perilous (broken line). Now guess which 36 best images of recession (or economic crisis) are likely to look like! See more: Mathieu Bernard-Reymond, French photographer and his « Monuments » series where he uses financial charts and statistics as basic shapes to produce photographic representations of global economic and ecological concerns.